I have worked on exploiting a TCP handshake vulnerability using native FreeBSD C libraries. * (c)2002-2014. Kris Nova. All rights reserved. * hopes of determining the threshold for availability. "Error number : %d . " Today we announce the release of Kubernetes kops 1.5.1 LTS! I figured what better way to announce the release, than with an updated blog post on setting up an HA cluster on private topology with the new release! In this tutorial we will cover setting up a HA privately networked Kubernetes cluster in AWS with Kubernetes kops 1.5.1. Fully managed VPC in AWS, with automatically generated private, and public subnets. Outbound traffic managed through a NAT gateway and elastic IP in each private subnet. Classic ELB fronting the Kubernetes API on TCP 443 (No firewall holes for the cluster). Classic ELB fronting a bastion ASG for resilient SSH access for admins. HA (Highly Available) Kubernetes masters spread across multiple availability zones in an ASG. Kubernetes nodes spread across multiple availability zones in an ASG. Public DNS alias for the Kubernetes API. Kubernetes kops is an open source tool that Kubernetes offers that can be used for deploying Kubernetes clusters in AWS. We will be using the tool in this tutorial. More information on installing kops can be found here for our non OS X users. We will also be needing a tool called kubectl. Think of this as a thin CLI client for the Kubernetes API, similar to the aws CLI tool we will be installing next. Use the AWS console to get an AWS AccessKeyId and AWS SecretAccessKey Official Documentaion. After you have your credentials, download the CLI tool and configure it with your new user. You can also use any method defined here. We strongly recommend using a single user with a select few IAM permissions to run kops. Thankfully kops provides a handy IAM creation script that will create a new user with the correct permissions. Be sure to note your new AccessKeyId and SecretAccessKey for the next step. We will need a publicly resolvable domain name for our cluster. So we need to make sure we have a hosted zone setup in Route53. In this example we will be using nivenly.com for our example hosted zone. More information on more advanced DNS setup. Kops will store a representation of your Kubernetes cluster in AWS S3. This is called the kops state store. It is important to note that kops DOES NOT store any concept of what resources are deployed. That would create two sources of truth (The AWS API, and the state store). Rather, kops will merely store a definition of the Kubernetes cluster, that will then be applied to AWS via kops. We will call our state store in this example nivenly-com-state-store. Okay! We are ready to start creating our first cluster. Lets first set up a few environmental variables to make this process as clean as possible. We will need to note which availability zones are available to us. These are different for every AWS account. In this example we will be deploying our cluster to the us-west-1 region. Lets form our create cluster command. Here we want to define a few things. This will tell kops to spread masters across those availability zones. Because there is more than 1, this will automatically be ran in HA. We define that we want to use a private network topology with kops. This is what tells kops to build the diagram above. Overlay networks are required for this configuration. Many thanks to our friends at Calico for helping us get this into kops! kops will deploy these instances using AWS auto scaling groups, so each instance should be ephemeral and will rebuild itself if taken offline for any reason. We now have created the underlying cluster configuration, lets take a look at every aspect that will define our cluster. This will open up the cluster config (that is actually stored in the S3 bucket we created earlier!) in your favorite text editor. Here is where we can optionally really tweak our cluster for our use case. In this tutorial, we leave it default for now. Okay, we are ready to create the cluster in AWS. We do so running the following command. After we verify the API is responding, we can now use the Kubernetes cluster. We should also now have a bastion server behind an elastic load balancer in AWS that will give us access to the cluster over SSH. Grab the bastion ELB A record, and the instance private IP you want to access from the AWS console and SSH into the bastion as follows. Please check out the most recent article instead. 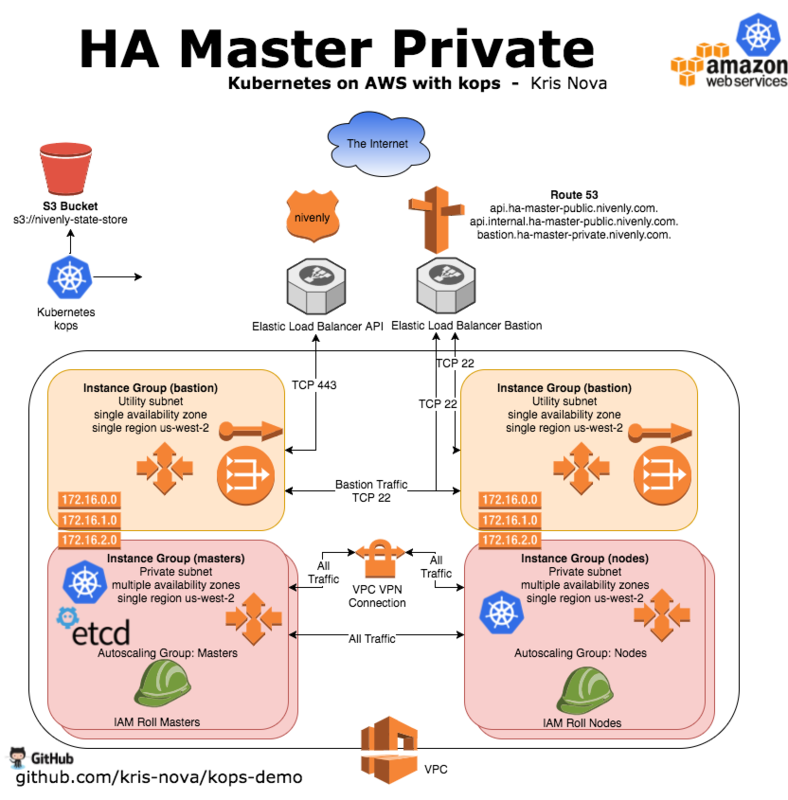 In this tutorial we will cover setting up a HA privately networked Kubernetes cluster in AWS with Kubernetes kops. Kubernetes kops is an open source tool that Kubernetes offers that can be used for deploying Kubernetes clusters against different cloud providers. We will be using the tool to help us with the heavy lifting in this tutorial. Start by installing the most recent version of kops from the master branch. You can download the tarball from the Kubernetes latest release page in github, or follow the official install guide here. In this example we will be using a dedicated IAM user to use with kops. This user will need basic API security credentials in order to use kops. Create the user and credentials using the AWS console. More information. Kubernetes kops uses the official AWS Go SDK, so all we need to do here is set up your system to use the official AWS supported methods of registering security credentials defined here. Here is an example using the aws command line tool to set up your security credentials. We should now be able to pull a list of IAM users from the API, verifying that our credentials are working as expected. In this example we will be creating a dedicated S3 bucket for kops to use. This is where kops will store the state of your cluster and the representation of your cluster, and serves as the source of truth for our cluster configuration throughout the process. We will call this nivenly-com-state-store. I recommend keeping the creation confined to us-east-1, otherwise more input will be needed here. Note: You don’t have to use environmental variables here. You can always define the values using the –name and –state flags later. We will need to note which availability zones are available to us. In this example we will be deploying our cluster to the us-west-1 region. Many thanks to our friends at Weave for helping us make this a staple part of our clusters! I always love comments, and suggestions on how to be better. Let me know your thoughts, if you have any good ones. I wrote a lot of the code for the features in this article, feel free to hit me up on github if you want to follow along! Suppose you want to execute a function, and you expect it to complete in a pre defined amount of time..
Maybe you just don’t care about the result if you can’t get it quickly. Timeout patterns in golang are very useful if you want to fail quickly. Particularly in regard to web programming or socket programming. The idea behind a timeout is handy, but a pain to code over and over. Here is a clever example of a concurrent timeout implementation, as well as an example on channel factories. Timeouts are the idea that the code should move forward based on an arbitrary defined amount of time, if another task has not completed. Concurrent factories are ways of generating channels in go, that look and feel the same, but can have different implementations. In the case of the code below, the getTimeoutChannel function behaves as a concurrent factory. We started 3 concurrent timeout factories, each with a unique channel. Each of the channels will timeout and return a value, after the defined sleep. In this example ch_a will obviously timeout first, as it only sleeps for 1 second. The switch statement will hang until one of the 3 channels returns a value. After the switch statement detects a value from a channel, it performs the logic for the corresponding case. This allows us to easily pick and chose which avenue the code should progress with further. Imagine if ch_a and ch_b were not timeout channels but rather actual logic in your program. Imagine if ch_a was actually a read from a cache, and ch_b was actually a read from a database. Let’s say the 2 second timeout, was actually a 2 second cache read. The program shouldn’t really care if the cache read is successful or not. If it is taking 2 seconds, then it is hardly doing it’s job as a quick cache anyway. So the program should be smart enough to use whatever value is returned first and not whatever value should be returned first. In this case, the database read. Now we are in a situation where we implemented a cache, and for whatever reason the cache doesn’t seem to want to return a value. Perhaps updating the cache would be in order? We can take our example one step further and keep the 5 second timeout on ch_c. For the sake of our experimental program, 5 seconds should be more than enough time for any of the supported avenues to return a meaningful value. If after the 5 seconds has elapsed and the first two channels haven’t reported any valuable data we should consider the system in a state of catastrophic failure, and report back accordingly. Simply add the failure path to the program, and rest assured that the program will handle even the most unexpected of edge cases quickly, and meaningfully. Now, doesn’t that seem like a great way to structure a program? Hi. I am Kris Nova. I am a twenty-something year old software engineer with an unhealthy passion for blogging and contributing to open source software. I like to write. I hope you find my work interesting and share your thoughts on them.